According to Rick, road trips are dumb, but at the end of the day, everything we do is meaningless. If you’re already laughing, then you’re a fan of Rick and Morty, the animated science fiction comedy on Adult Swim. 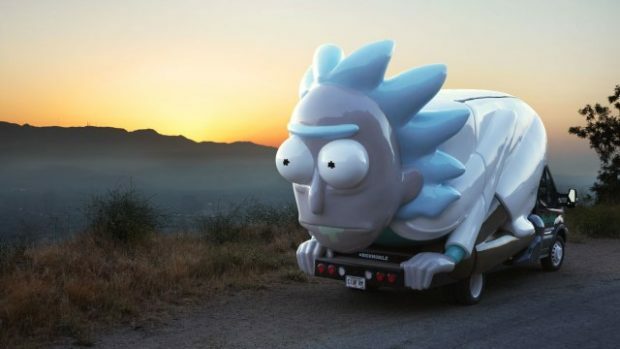 And you want to visit the Rickmobile, which will not only allow you to celebrate a beloved show, but also allow you to buy merchandise! One of our home stores, Illusive Comics & Games in Santa Clara, will be hosting the Rickmobile on Saturday, July 15, 2017. It will make this stop on its “Don’t Even Trip Road Trip Across America 2017″ tour from 12 p.m. to 3 p.m., so line up early, and be aware — it’s rumored that the “world’s biggest Rick” only accepts credit cards.